Means more time to explore new places like this Korean restaurant. Located at the quieter side of town aka The Intermark since 28 January, they claim to be serving Korean fine dining. Their name Onsemiro means, "taste of nature." While I can't claim to be an expert in Korean fine dining, service was definitely top notch and they do offer some unusual items I have not seen in other Korean places. One unusual item was the yukhoe bibimbap (RM45). 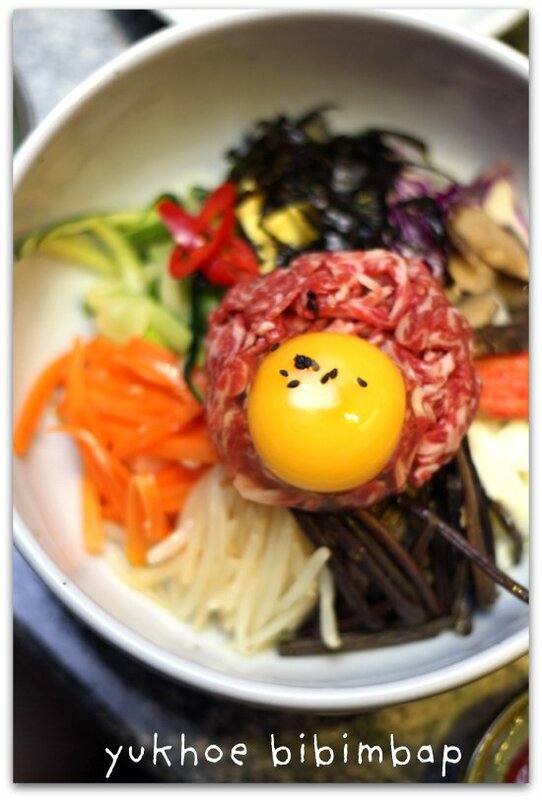 Instead of cooked beef, the rice dish is topped with beef tartare. You mix everything together with your chopsticks - the vegetables, beef, rice and the Korean chilli paste gochujang for a satisfying meal. Another unusual dish was Ganjang-gejang, marinated crab in soy sauce (gejang). On the menu they are stated as market priced but that amount served was around RM30. 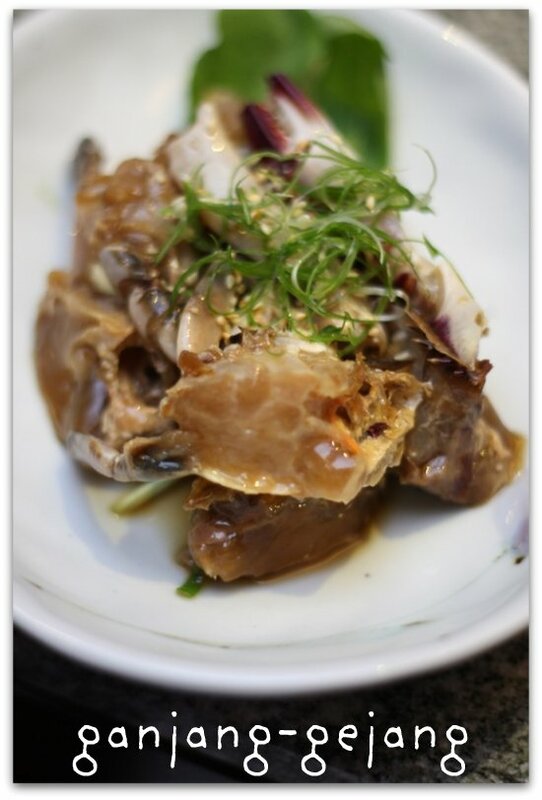 Not for the faint hearted, these are raw crabs that are lightly fermented in the salty mixture. You eat it like a cold appetizer with a bit of porridge to alleviate the saltiness. Rather nice to eat amid the heat from the BBQ grill since it is cool. They have a few sets including a grand opening dinner special (Modumsaenggogi set) for RM60 per person that features assorted grilled meats, cold dish, soybean paste stew, three kinds of pan-fried fish and vegetables, cold buckwheat noodles. The meats are of premium quality including wagyu and Korean premium beef. 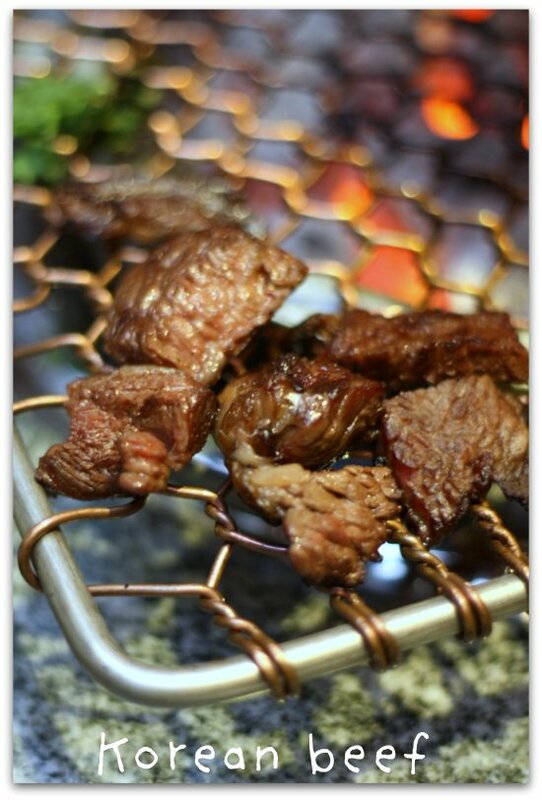 We settle for the Hanudeungsimsukbul-gui set (RM200 per person) that uses Korean premium beef sirloin. 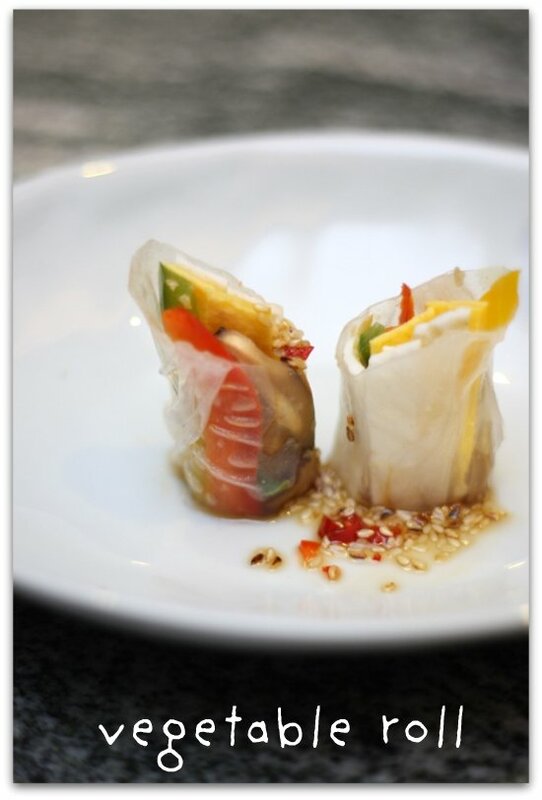 All the side dishes are exquisitely prepared such as the vegetable roll. 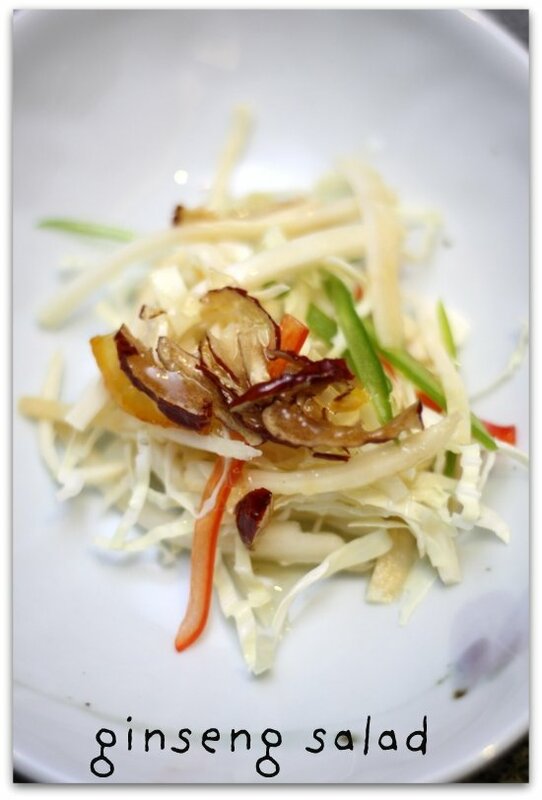 I love the cold ginseng side dish with bits of tangy citrus to uplift the salad. There is spring onion kimchi, a cold cabbage kimchi and this leaf that has a nice smoky woody taste to it. 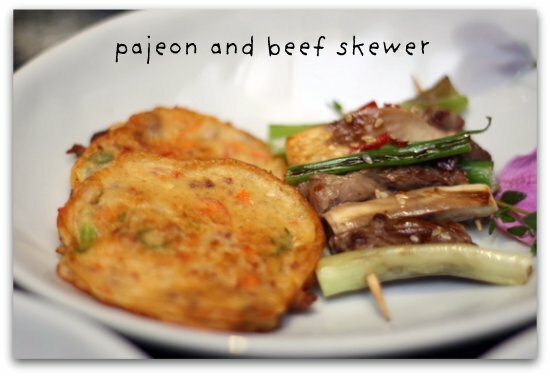 We also enjoy baby pajeon (pan fried pancake), a beef skewer and crispy light tempura vegetables, while they grilled the beef. The beef is tasty wrapped with the lettuce leaves with a dab of the tangy sauce and garlic cloves. 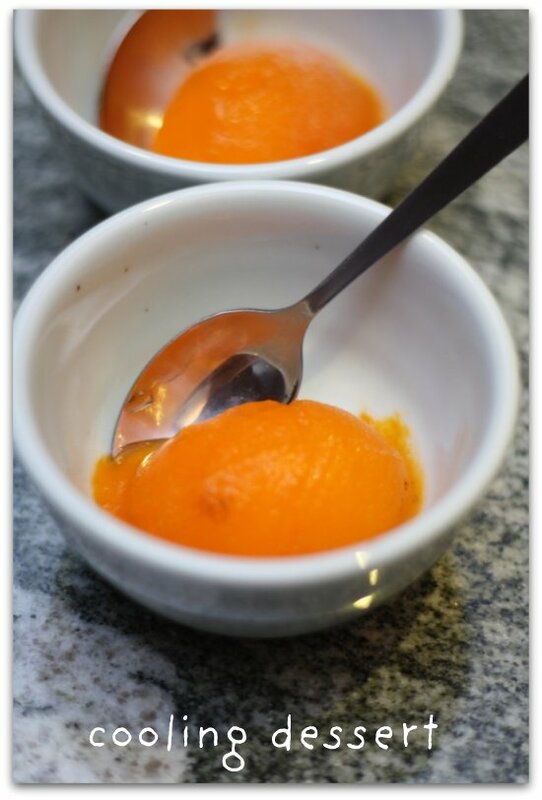 To end the meal, it was a cup of Korean green tea and this cooling dessert that resembled a sherbet of sorts. Very refreshing after all that heat from the kimchi and the grilled beef. Prices are definitely on the higher side here but the restaurant seems to also cater for all sorts of budget with the introductory set. The set lunches also look reasonable being priced at RM20. There are not many choices though (four if I am not mistaken) but they serve a bulgogi stir fried beef with vegetables, and a tempura one. The sets are served in a bento box. It all looks amazing. I wish we had a good Korean restaurant around here. The yukhoe bibimbap sounds and looks great! The colors are really vibrant. Korean fine cuisine? Would I be the first restaurant of the sort? Mostly I've only tried the Korean BBQ places, haha. We seldom eat Korean food, we usually have BBQ and ginseng chicken soup. Onsemiro seems very different. Onsemiro Cuisine! Must go & try it! Had no idea this place was even there. The portions look quite small for the prices but every thing looks fresh in the pictures. OMG steak tartare!!!!!! let's go! Arghh til 12th FEb only? ?